For carrying out section 301 and title IV of the PHS Act with respect to drug abuse, [$1,028,614,000] $1,047,397,000. Major changes by budget mechanism and/or budget activity detail are briefly described below. Note that there may be overlap between budget mechanisms and activity detail and these highlights will not sum to the total change for the FY 2016 President’s Budget for NIDA, which is $31.692 million more than the FY 2015 level, for a total of $1,047.397 million. Research Project Grants (+$23.879 million; total $640.523 million): NIDA will support a total of 1,260 Research Project Grant (RPG) awards in FY 2016. Competing RPGs will increase by 15 awards and decrease in the amount of $6.519 million. About 874 non-competing RPGs, totaling $463.002 million, also will be made in FY 2016. Within the total, research priorities include those that position the Institute to advance the development of medications, using innovative genetics tools and technologies, and translating the results of evidence-based findings to improve drug abuse interventions and promote greater access to them worldwide. Another priority for FY 2016 is the Adolescent Brain Cognitive Development (ABCD) Study. NIH is requesting a total of $70.000 million in FY 2016 to advance the high priority research areas of the Brain Research through Advancing Innovative Neurotechnologies (BRAIN) Initiative, as outlined in its interim strategic plan. NIDA is requesting an increase of $7.000 million in its budget to support this research priority. NIH is requesting a total of $130.000 million in FY2016 for the Precision Medicine Initative. NIDA is requesting $3.604 in its budget to support this research priority. The impact of substance use and addiction in this country is daunting: the economic toll alone exceeds $600 billion a year in health care, crime-related, and productivity losses, and over 500,000 wholly preventable premature deaths per year can be ascribed to substance use disorders (SUDs). Drug abuse and addiction present a complex and continuously changing landscape currently accelerated by marijuana’s shifting legal status, continued high rates of prescription drug abuse, the expansion of synthetic drugs, and the development of electronic devices for drug delivery (e.g., e-cigarettes), as well as by the shifting policies resulting from healthcare reform and parity regulations. The National Institute on Drug Abuse (NIDA) strives to meet these challenges and the opportunities brought about by healthcare reform by harnessing data and technology, creating public-private partnerships, and promoting science-informed practice and policy. The rapid progress of the past few years of addiction research has been fueled in part by technological advances, particularly in high-throughput genotyping, genetic tools for the manipulation of neuronal circuits and brain imaging. These advances in basic research have enhanced our understanding of the genetic, developmental, structural, and environmental factors that influence brain function in health and disease. In addition, the arrival of “Big Data” has revolutionized the prospects of brain imaging, clinical trials, surveillance, and treatment development. Cutting-edge research platforms (e.g., Optogenetic and Transgenic Technology Core or OTTC, see program portrait) will now be leveraged to investigate, for example, the circuitry of addiction, drug use trajectories (e.g., the gateway theory), and the impact of intrauterine exposure to drugs, with unprecedented detail. One of the best illustrations of the potential for these advancements is the planned Adolescent Brain Cognitive Development (ABCD) study (see program portrait) designed to address the urgent need for collecting rigorous longitudinal data on the effects of marijuana, alcohol, nicotine, and other drugs on an individual’s brain developmental trajectories and their impact on health and related outcomes. This study will also set the foundation to advance our understanding of the role of genes in guiding brain development through adolescence and in mediating the impact of drugs or other adverse environmental exposures. It will also shed light on the influence of gender on the impact of drug use on brain development. To address the shifting and complex nature of SUDs, it is critical to identify and nurture a talented, diverse, and innovative workforce as well as leverage the complementary resources available from a broad range of strategic partners. NIDA engages in multiple public and private collaborations to advance our scientific mission. Worth noting is the recently established Collaborative Research on Addiction at NIH (CRAN), a robust trans-NIH framework that enables its member institutes (NIDA, NIAAA, and NCI) to integrate resources and multidisciplinary expertise to advance substance use and addiction research. NIDA also collaborates with the Food and Drug Administration (FDA) in a large-scale tobacco regulatory research initiative, the Population Assessment of Tobacco and Health (PATH) study that will follow an estimated 45,000 people ages 12 to 18 to assess susceptibility to tobacco use, risk perceptions, use patterns (including delivery devices), and health impacts. The results will help set tobacco product standards, communicate the risks of tobacco use to the general public, and protect the public health. The past 15 years have yielded significant advances in our understanding of the neurobiology of SUDs, with several of these advances now being ripe for translation. However, the pharmaceutical sector has not traditionally been heavily engaged in developing treatments for SUDs. Therefore, NIDA has initiated multiple partnerships with the pharmaceutical industry. For example, one current collaboration is evaluating the efficacy of new or repurposed medications for the treatment of SUDs (e.g., lorcaserine, a new mediation for weight loss). Another example is NIDA’s partnership with nine major pharmaceutical companies to conduct the FDA-mandated study to evaluate immediate and extended release (IR/ER) opioid medications. NIDA is collaborating with these companies to conduct studies that will qualitatively estimate the risks associated with long-term use of opioid analgesics for management of chronic pain, including misuse, abuse, addiction, overdose, and death. In addition, these studies will work to improve tracking of adverse outcomes and develop standards for identifying patients who are “doctor shopping” -moving from provider to provider—in an effort to obtain multiple prescriptions for the drug(s) they misuse. Dissemination of research findings into clinical practice is a NIDA priority often best pursued through partnerships. For example, the NIDA/SAMHSA Blending Initiative accelerates dissemination of research-based treatment findings into clinical practice. NIDA also works closely with Federal partners (CDC, CMS, FDA, SAMHSA) and non-governmental stakeholders to address SUD-related public health priorities like responding to the dramatic increase in opioid-related overdoses through improved prescribing practices, increasing access to medication assisted treatment, and making naloxone more available to prevent overdose deaths (see below). NIDA’s efforts to translate scientific research to improve clinical practice and inform public health policy are multifaceted. NIDA helped develop the Health Registry of Outcomes (HERO) to capture detailed, longitudinal, patient-reported outcomes on physical, psychological, and social health to better understand the factors that contribute to pain treatment outcomes. NIDA is also focused on transforming clinical practice to minimize the risk of opioid overdose through developing continuing medical education (CME) courses for health care workers and coordinating the Centers of Excellence in Pain Education (CoEPEs), a part of the NIH Pain Consortium. The CoEPEs develop and disseminate pain management curricula to improve how health care professionals are taught about pain and its treatment. Research on HIV prevention and treatment strategies with hard-to-reach populations, such as those in the criminal justice system or with co-morbid conditions (e.g., hepatitis C), is a current priority. In parallel, NIDA supports basic research to understand how drugs interact with the HIV virus and how HIV affects the function of the human brain and drug-taking behaviors. NIDA is also positioned to evaluate the potential impact of shifting marijuana policies on public perceptions, use prevalence, developmental effects, use of other drugs (i.e., gateway effects), and health outcomes. NIDA also continues to study the harms related to adolescent use and the therapeutic potential of endocannabinoids in pain and addiction. Using a multipronged strategy consisting of harnessing data and technology, public-private partnerships, and science-informed practice and policy, NIDA is positioned to effectively translate its investments in genetics, neuroscience, pharmacotherapy, and behavioral and health services research into better ways of preventing and treating SUDs and their consequences. The rapid expansion of technological capabilities has opened new horizons for biomedical research. Much is known about the effects of addiction on the mature adult brain, but understanding of the impact of marijuana (and other drug) use during adolescence is much more limited. As part of the Collaborative Research on Addiction (CRAN), a trans-NIH consortium involving NIDA, NIAAA, and NCI, and in partnership with NICHD, the ABCD study is planned to address this knowledge gap. As the largest longitudinal brain-imaging study of adolescents ever, the ABCD study will follow approximately 10,000 U.S. adolescents for 10-12 years to determine whether use of marijuana, alcohol, nicotine, or other drugs is associated with changes in brain function and behavior throughout development. Participants will be recruited prior to any substance use and over 10-12 years will periodically undergo a variety of tests such as brain imaging, genetic, psychiatric, and cognitive testing. Longitudinal studies have the potential to identify predictors of adolescent substance misuse and to delineate the role of social, psychological, and biological mechanisms. Consistent with this notion, a relatively small study based on 692 European teenagers had previously identified brain structures and activity patterns that could predict, with around 70 percent accuracy, which 14-year-olds would become binge drinkers by the age of 16. The ABCD study is the obvious next step: Although the study may not establish direct causality, its large sample size is likely to reveal greater detail on differences in brain structure between drug users and non-users that will help researchers differentiate the roles of the myriad environmental and genetic factors that influence developmental trajectories. In May 2014, a public expert panel workshop was held to inform the development of this new initiative and issue guiding recommendations with regards to the central research questions and general issues of study design. In addition, a satellite event on the ABCD longitudinal study was held in November 2014 at the Society for Neuroscience’s 44th Annual Meeting in Washington, D.C. to obtain further feedback from the broader research community . It is anticipated that study development, planning and initial piloting will occur in FY 2015. An additional $6.0 million in funding is reqested for FY2016 when subject recruitment and testing will begin. Just as the 65-year-old Framingham Heart Study revolutionized our understanding of cardiovascular disease, the ambitious ABCD initiative is poised to produce significant findings and improve our ability to predict, mitigate, or counteract the risk for SUDs among this nation’s youth. This study will leverage recent technological advances at a time when there is an increasing need for a better understanding of the deleterious effects of drug use on brain development in adolescence, a period of great vulnerability for drug experimentation and for the emergence of psychiatric disorders. The past few years have brought dramatic advancements in technologies for developing genetically altered animal models and visualizing or manipulating functional brain circuits. One of the best examples is Optogenetics, a technology that combines advanced genetic and optical techniques to allow scientists to insert light-sensing proteins into neurons and then use pulses of light to turn on or off specific neuronal pathways. By allowing fast (millisecond) and precise (cell specific) optical control of cellular processes, optogenetics has opened up completely new opportunities for investigating biological systems in both healthy and diseased states. In 2012, NIDA established the Optogenetics and Transgenic Technology Core (OTTC) to leverage these technologies and advance research on the impact of illicit drug use on neural systems. The OTTC at the NIDA Intramural Research Program was established for the purpose of developing technologies to understand the contributions and connections of specific brain cells in cognitive and behavioral functions related to addiction. As part of these efforts, OTTC develops novel transgenic animal models (i.e., animals that have been genetically altered to allow investigation of a gene’s function) as well as means of efficiently delivering genetic information into the targeted cells (e.g., viral vectors ) that serve as a versatile platform for understanding the cellular and molecular functions of brain cells in cognition, emotions, behavior, and disease. OTTC places an emphasis on developing transgenic tools that will be generally useful to the broader scientific community. The tools developed by the OTTC will be available to other NIH scientists as well as external scientists to facilitate research to better understand the neurocircuitry of addiction and related behaviors. Several high-profile publications in the field of SUD have already been facilitated by the OTTC. One such study used optogenetics to increase glutamate levels in the brain’s reward center and confer protection against compulsive cocaine seeking. Another study used optogenetics to inhibit brain activity in the prefrontal cortex, thus attenuating the propensity of a rat to seek rewarding foods when exposed to stress. These results represent significant improvements in our understanding of circuitry underlying compulsive behaviors such as drug seeking and relapse to maladaptive eating habits during dieting. These technologies are harbingers of exciting future discoveries in the study of addiction and in related fields. The rate of death from opioid overdoses (prescription pain killers and heroin) in the United States has skyrocketed since 1999. This alarming trend led HHS to deem opioid overdose death an epidemic and prompted widespread Federal, State, and local actions. Combating the epidemic of opioid abuse requires a multi-pronged approach that involves reducing drug diversion, expanding delivery of existing treatments (including medication-assisted treatments), and development of new non-opioid treatments for pain. But another crucial component is naloxone, an opioid antagonist that binds to opioid receptors to reverse or block the effects of other opioids. Naloxone can rapidly restore normal respiration to a person who has stopped breathing as a result of overdose from abusing heroin or prescription opioids or accidentally ingesting too much pain medication. Naloxone is widely used by emergency medical personnel and other first responders. Unfortunately, by the time a person overdosing is reached and treated, it is often too late. To solve this problem, several experimental overdose education and naloxone distribution (OEND) programs have issued naloxone directly to opioid users and their friends or loved ones, or other potential bystanders, along with brief training in how to use these emergency kits. Such programs have been shown to be an effective, as well as cost-effective, way of saving lives. Naloxone is currently only FDA approved in an injectable formulation. To facilitate ease of use, many OEND programs use syringes fitted with an atomizer to enable the drug to be sprayed into the nose. NIDA and other agencies are working with the FDA and drug manufacturers to support the development and approval of a user-friendly intranasal formulation that would match the pharmacokinetics (i.e., how much and how rapidly the drug gets into the body) of the injectable version. Such an innovation will provide an alternative to the self-injectable naloxone recently approved by FDA and is expected to be less expensive and easier to use. Over 16,000 Americans died from an overdose involving prescription painkillers in 2012, and we are now seeing indicators of a rise in heroin overdose deaths. If we are to reverse these trends, we need to do all we can to ensure that emergency personnel, as well as at-risk opioid users and their loved ones, have access to tools like intranasal naloxone that can save lives in the event of overdose. Overall Budget Policy: The FY 2016 President’s Budget request for NIDA is $1,047.397 million, an increase of $31.692 million or 3.1 percent above the FY 2015 Enacted level. Research priorities include those that position the Institute to advance the development of medications, taking advantage of innovative genetics tools and technologies, and translating the results of evidence-based findings to improve drug abuse interventions and promote greater access to them worldwide. HIV prevention and treatment is another top NIDA research priority, including research on the interactions between HIV, substance use disorder, and other comorbid psychiatric disorders, linking vulnerable populations to HIV prevention, testing, and treatment services, addressing HIV/AIDS-related health disparities, and integrating the treatment of substance use disorder and HIV. Funds are included in competing RPGs to support the trans-NIH BRAIN Initiative as well as the Precision Medicine Initiative. Basic and Clinical Neuroscience: The Basic and Clinical Neuroscience portfolio seeks to expand our understanding of the fundamental neurological, genetic/epigenetic, and behavioral processes that underlie SUDs. Central to this goal are efforts to tease apart the multiple factors that contribute to drug abuse and addiction risk, with particular attention to significant individual differences in risk and responses to drugs while at the same time expanding our basic knowledge of the function of the brain from the molecular to the behavioral. Key projects are investigating the effects of drugs on gene expression and brain development and function, and exploring gender-related differences in these effects. Risk for addiction is profoundly affected by an individual’s genes as well as environmental conditions, such as stress and early exposure to drugs of abuse. Additional studies are exploring the mechanisms underlying these effects, including the role of epigenetic changes that can influence long-term patterns of gene expression in specific brain cells (neuron and glia) without changing DNA sequence. Collectively, this research will improve our understanding of the basic neural and genetic mechanisms that underlie drug abuse and addiction and will provide critical insights toward the development of more effective approaches for the prevention and treatment of SUDs. For example, continuing efforts to improve our understanding of the endocannabinoid system are opening up new areas of investigation for the development of novel pain and addiction treatments. Other projects are exploring the basic processes underlying resilience against SUDs in childhood and adolescence. In addition, and in line with the goals of the President’s Brain Research through Advancing Innovative Neurotechnologies (BRAIN) Initiative, NIDA is supporting research to: 1) develop advanced technologies that improve our ability to study the organization and function of the living brain; 2) better understand the interactions of complex neural circuits including those that mediate reward, aversion to drug effects, and related decision making through development; and 3) develop strategies to therapeutically influence SUD-relevant brain circuits (e.g., transcranial magnetic and deep brain stimulation, neurofeedback, optogenetics). Progress in these combined areas will revolutionize our ability to mitigate or even reverse the deleterious effects of addiction. 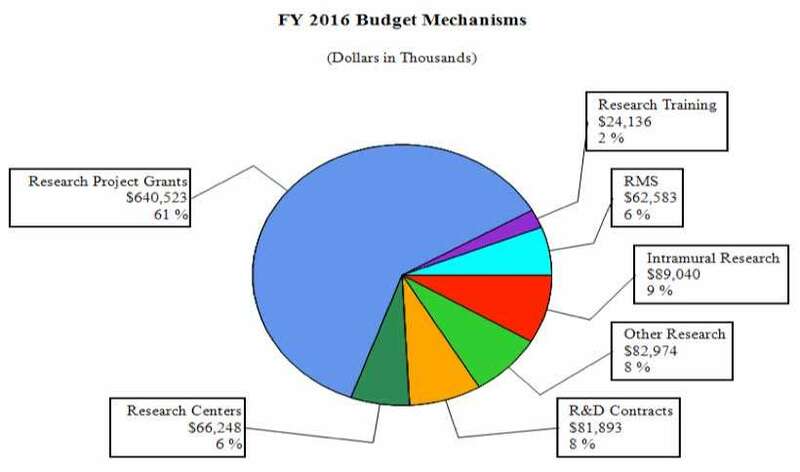 Budget Policy: The FY 2016 President’s Budget request for this program is $446.599 million, an increase of $15.536 million or 3.6 percent over the FY 2015 Enacted level. Epidemiology, Services, and Prevention Research: This NIDA Division supports integrated approaches to understand and address the interactions between individuals and environments that contribute to drug abuse-related problems. It supports large surveys (e.g., the annual Monitoring the Future survey, which tracks drug use and related attitudes among teens) and surveillance networks to monitor drug-related issues and trends locally and nationally, such as the emergence of synthetic drugs and e-cigarettes. It also supports a large research network for conducting studies related to treatment of SUDs in the criminal justice system, including studies that pertain to the implementation of medication-assisted treatment (MAT) and seek, test, treat, and retain (STTR) for illicit drug users at risk for HIV. Program efforts also help identify illicit drug use trends locally, nationally, and internationally; guide development of responsive interventions for a variety of populations; and encourage optimal implementation and service delivery in real-world settings. For example, NIDA recently launched an innovative National Drug Early Warning System (NDEWS) to monitor emerging trends related to illicit drug use and to identify increased use of designer synthetic compounds. NDEWS will generate critical information about new drug trends in specific locations around the country so that rapid, informed, and effective public health responses can be developed and implemented precisely where and when they are needed. NIDA is also supporting research to better understand the impact of policy changes related to substance use including implementation of health reform and changes in state policies related to marijuana. Specifically, current research is evaluating: 1) the impact of health reform on access to quality treatment for persons with SUDs and 2) the longer-term outcomes resulting from changes in State marijuana policies such as trends in use, harm perception, health consequences including trauma and death from car accidents, and educational outcomes, particularly for adolescents and young adults. Such knowledge can be then used to inform policy and to improve prevention and treatment interventions. Budget Policy: The FY 2016 President’s Budget request for this program is $265.784 million, an increase of $9.246 million or 3.6 percent over the FY 2015 Enacted level. Pharmacotherapies and Medical Consequences: Since the pharmaceutical industry has had limited involvement in the development of medications for SUDs, the responsibility for their development has rested largely with NIDA; NIDA, therefore, has developed a program that is responsible for medications development for SUDs. To leverage NIDA resources, this program encourages the formation of alliances between strategic partners (such as academic institutions, pharmaceutical and biotechnology companies) with the common goal of advancing medications through the development pipeline toward FDA approval in a timely manner. NIDA conducts research to decrease the risk associated with medications development to make it more appealing for pharmaceutical companies to complete costly phase IIb and III clinical studies. An example of such a project is a partnership with AstraZeneca to explore a novel medication that modulates the activity of glutamate – an excitatory neurotransmitter – to treat drug addiction. Preclinical studies with this class of molecules indicate that it could be effective for treating abuse of various drugs such as tobacco and cocaine. Another example is the partnership with two biotechnology companies to support the development of an intranasal formulation of naloxone (see program portrait on intranasal naloxone). In addition, NIDA is collaborating with Teva Pharmaceutical Industries on a clinical trial to test the efficacy and safety of a cholinesterase compound that has shown promise in pre-clinical trials for the treatment of cocaine addiction. NIDA also hosted a conference bringing together basic and translational researchers along with representatives from the pharmaceutical industry to evaluate emerging targets for stimulant use disorders and to identify ways to accelerate this area of research. NIDA is also continuing to invest in research supporting the development of vaccines and antibodies for the treatment of SUDs. A lingering challenge in this area has been the development of vaccines that stimulate an immune response powerful enough to neutralize high concentrations of a drug before it enters the brain. Budget Policy: The FY 2016 President’s Budget request for this program is $137.531 million, an increase of $4.784 million or 3.6 percent over the FY 2015 Enacted level. Clinical Trials Network (CTN): CTN comprises 13 research nodes and more than 240 community treatment programs and/or medical settings in 38 States plus the District of Columbia and Puerto Rico. The CTN develops and tests the feasibility and effectiveness of promising medications and behavioral treatment approaches for SUDs and related disorders, such as comorbid mental health disorders and HIV, with diverse patient populations and community treatment providers. The CTN is currently conducting studies evaluating: 1) a comparison of Vivitrol® (naltrexone for extended-release injectable suspension) to Suboxone® (buprenorphine and naloxone) Sublingual Film for patients addicted to heroin or other opioids, including prescription pain relievers; 2) N-acetylcysteine for treatment of marijuana addiction; 3) a combination therapy with Vivitrol® plus Wellbutrin XL® (bupropion hydrochloride, Extended-release Tablets) for treatment of methamphetamine addiction; 4) Vivitrol® for HIV-positive opioid users in HIV settings; and 5) and a brief screening and assessment instrument to identify patients with SUDs in general medical settings. Budget Policy: The FY 2016 President’s Budget request for this program is $45.860 million, an increase of $1.595 million or 3.6 percent over the FY 2015 Enacted level. Intramural Research Program (IRP): IRP performs cutting-edge research within a coordinated multidisciplinary framework to: 1) elucidate the nature of the addictive process; 2) determine the potential use of emerging new therapies for SUDs, both pharmacological and psychosocial; and 3) establish the long-term consequences of drugs of abuse on systems and organs, with particular emphasis on the brain and its development, maturation, function, and structure. For example, the IRP is furthering substance use disorder research through the recently established Designer Drug Research Unit (DDRU), which was created in response to the worldwide epidemic of synthetic drug use. Synthetic drugs are marketed as safe, cheap, and legal alternatives to illicit drugs like marijuana, cocaine, and MDMA (a.k.a. Ecstasy). However, they can produce serious cardiovascular and neurological consequences that can be fatal. Many popular designer drugs have been rendered illegal by regulatory control, but new replacement analogs are flooding the marketplace at an alarming rate. IRP is uniquely poised to respond to this public health crisis by collecting, analyzing, and disseminating current information about the pharmacology and toxicology of newly emerging designer drugs. Similarly, IRP is working to develop and evaluate quicker, more reliable, and more accurate roadside tests for drug-related intoxication. With the legalization of recreational or medical marijuana use in some states, this is a critically needed tool for enforcing drug-impaired driving laws. IRP has also established a Medications Development Program that works with NIDA’s Extramural Division of Pharmacotherapies and Medical Consequences of Drug Abuse, NIAAA, NCATS, and the Brain Science Institute, Johns Hopkins University School of Medicine, to identify potential targets for addiction medication development. In addition, the IRP is working to develop advanced new technologies to genetically manipulate and study the organization and function of brain circuits involved in SUDs (see program portrait on optogenetics). Budget Policy: The FY 2016 President’s Budget request for this program is $89.040 million, a decrease of $0.089 million or 0.10 percent under the FY 2015 Enacted level. Research Management and Support (RMS): RMS activities provide administrative, budgetary, logistical, and scientific support in the review, award, and monitoring of research grants, training awards, and research and development contracts. Additionally, the functions of RMS encompass strategic planning, coordination, and evaluation of NIDA’s programs, regulatory compliance, international coordination, and liaison with other Federal agencies, Congress, and the public. NIDA currently oversees more than 1,600 research grants and more than 130 research and development contracts. In addition to the infrastructure required to support research and training, NIDA also strives to provide evidence-based resource and educational materials about SUDs and to raise awareness of the science relating to cutting-edge issues such as marijuana research, opioid overdose prevention, and Medication Assisted Treatments. Budget Policy: The FY 2016 President’s Budget request for this mechanism is $62.583 million, an increase of $0.620 million or 1.0 percent over the FY 2015 Enacted level. Education and Outreach: The Office of Science Policy and Communication (OSPC) leads NIDA’s strategic efforts to inform public health policy and practice by ensuring the institute is the primary trusted source for scientific information on drug abuse and addiction. Healthcare providers are a key target audience for NIDA’s outreach efforts. NIDA leads the NIH Pain Consortium Centers of Excellence in Pain Education (CoEPEs); these twelve centers work to enhance patient outcomes by improving the education of healthcare professionals about pain and its treatment. The CoEPEs act as hubs for the development, evaluation, and distribution of pain management curriculum resources for medical, dental, nursing and pharmacy schools to improve how health care professionals are taught about pain and its treatment. NIDA is also committed to being at the forefront of training the next generation of innovative researchers by supporting both pre-doctoral and postdoctoral-level scientists interested in drug abuse research. These efforts also focus on increasing the number of underrepresented scholars and researchers, including women and minorities, actively participating in drug abuse research through our outreach, and sponsored career development and research training opportunities. Common Fund – NIDA has a lead role for the Common Fund-supported Epigenomics Program and also administers a data management center for the Common Fund Extracellular RNA Communication Program. NIDA co-leads a Common Fund workgroup to explore the new scientific area “Enabling the exploration of eukaryotic epitranscriptomics (E4)”. NIH Pain Consortium – NIDA is the lead on the NIH Pain Consortium Centers of Excellence in Pain Education (CoEPEs) to enhance patient outcomes by improving the education of healthcare professionals about pain and its treatment. This collaboration recently hosted a Pathways to Prevention Workshop that resulted in a report summarizing the state of the field and identifying future research priorities. 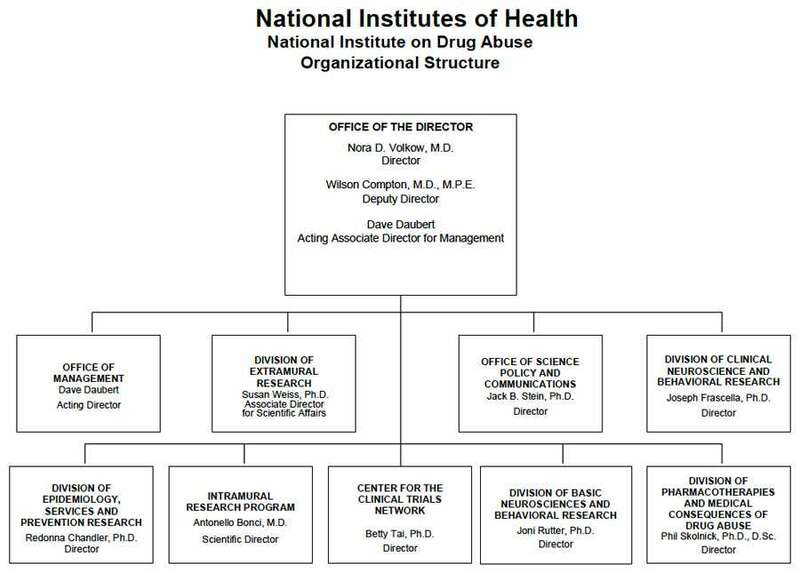 Collaborative Research on Addictions at NIH (CRAN) – NIDA, NIAAA, and the Tobacco Control Branch within NCI together make up CRAN, which was established in 2013 to add synergism and efficiency to the addiction research field. In 2014, CRAN released five funding announcements to promote collaborative research on addiction and research training. This includes administrative, competitive, and training supplement awards, as well as research on social media as a tool to better understand, prevent, and treatment substance use. CRAN, in collaboration with NICHD also solicited input from the research community to inform program design for the Adolescent Brain Cognitive Development (ABCD) study described above (see program portrait). NIDA is also integrally involved in the President’s BRAIN (Basic Research through Advancing Innovative Neurotechnologies) Initiative - a trans-agency effort that includes NIH, the National Science Foundation, and Defense Advanced Research Projects Agency (DARPA). This initiative is building on recent advancements in neuroscience to create and apply new tools for producing dynamic pictures of the brain that show how individual brain cells and complex neural circuits interact. This new understanding will allow scientists to explore how the brain records, processes, uses, stores, and retrieves vast quantities of information, and will shed light on the complex links between brain function and behavior. The information gleaned from this initiative will provide an unprecedented view of the complex neural changes that occur in addiction, leading to new approaches for treating and preventing this and other brain diseases. Precision Medicine Initiative - NIH proposes to launch a national research cohort of one million or more Americans – to propel our understanding of health and disease and set the foundation for a new way of doing research through engaged participants and open, responsible data sharing. Participants who voluntarily choose to join this effort will be able to share their genomic data, biological specimens, and behavioral data, and, if they choose, link it to their electronic health records (EHRs), taking advantage of the latest in social media and mobile applications, and with appropriate privacy protections in place. Bona fide researchers from across the country will have access to data voluntarily provided, thereby crowdsourcing rich data to the brightest minds in biomedical research. The cohort will be built largely by linking existing cohorts together taking advantage of infrastructure, data security and expertise already in place. NIH will help to connect these existing cohorts, but the current sponsors of the cohorts will maintain their ownership and management. Research on this scale promises to lead to new prevention strategies, novel therapeutics and medical devices, and improvements in how we prescribe drugs – on an individual and personalized basis. Download the full 2016 Fiscal Year Budget (PDF, 1MB).